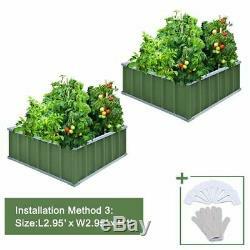 KING BIRD 4 Installation Methods For DIY Extra-thick 2-Ply Reinforced Card Frame Raised Garden Bed W/8pcs T-type Tags & A pair of GlovesGreen. 8pcs T-type Tags & 1 Gloves Free. A pair of gloves provided to give you more convenience and comfort when installing and working in the garden and 8pcs T-type Tags to help you record the growth process of flower and vegetable. 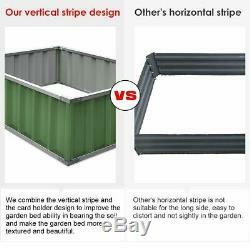 We have 2 sizes: 68''x 36''x 12'' (green & grey) and 67.2'' x 67.2''x 12'' (green & grey). 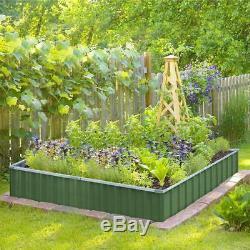 And 67.2'' x 67.2''x 12'' raised garden bed can be assembled in 4 different sizes as you need. Upgraded multilayer galvanized paint efficiently prevents rust and continues to beauty; also never worry about that pest and rain damage the wood garden bed; galvanized steel garden bed provides a lasting use and no discoloration. About KING BIRD Garden Bed KING BIRD raised garden bed has more advantages in convenient assembly, advanced and pressure-resistant design, and color selections. Jade-green and charcoal-grey, these natural color can make a beauty blending into any landscape, your garden, backyard, patio, rooftop, landscape. Meanwhile, we re proud of our customer service. If you have any problem or questions that we can help, we'll spare no efforts. 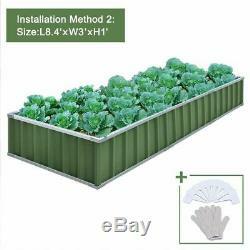 4 Installation Methods For DIY--- this garden bed has 4 installation methods, 5.6x5.6x1 or 8x3x1 , 3x3x1(x2) and another size , you can decide the size according to your private garden, much bigger size with a cheaper price. 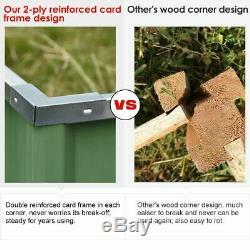 Extra-thick 2-Ply Reinforcement--- Double card frames on the two sides of sheet make the garden bed more durably and stably; never worry about its distorted or collapsed and it presents much more beautiful design. Multilayer Galvanized Paint--- Upgraded multilayer galvanized paint efficiently prevents rust and continues to beauty; also never worry about that pest and rain damage the wood garden bed; galvanized steel garden bed provides a lasting use and no discoloration. No painting inside , no worries about the damage for plants. 8pcs T-type Tags & 1 Gloves Free--- A pair of gloves provided to give you more convenience in installing and comfort when working in the garden. 8pcs T-type Tags to help you to record the growth process of flower and vegetable. Q: Not sure for its steadiness? A: The card buckle on the sheet can fix the garden bed totally. If you still have Doubt? OK, we still provide screws for your worries; so, this is the most reinforced garden bed. Q:Whats the function of card frames? A: Only the steel sheet cant guarantee the long time working of the garden bed, our kingbird garden bed owns double card frames, which can help to strength and reinforce the structure. Q: Why is this garden bed simple to assemble? 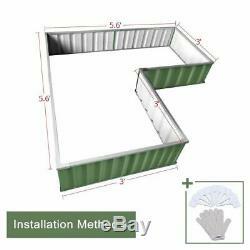 A: Just need push on the card frame to the sheet on each side; and the card buckle on the sheet can fix the garden bed totally; we also provide a pair of gloves to help you assemble. Three minutes and it will work for you. Q: If Im not sure that my place is suitable for this garden bed or not; what should i do? A: If you want this perfect raised garden bed but worry your garden or patio is not suitable, you just need use one sheet not two sheets on the length of garden bed, then you will find this garden bed has two different size for you. Size: 5.6' x 5.6' x 1' (or 8.4' x3' x1', or 2x 2.95'x 2.95'x1'). Size of card frame: 0.9 width. Net Weight: 20.5 lbs. Package Weight: 24.3 lbs. Capacity: 31 Cu Ft of Soil. 1x Garden bed in parts 1x Installation Instruction 1x gloves(as gift) 8x T-type Tags(as gift). Our kingbird raised garden bed also has size 68"x 35.5"x 11.8 in this two colors 2. 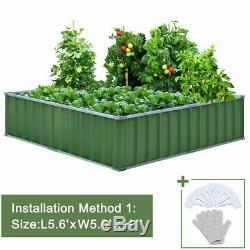 You will feel more easy and necessary by wearing the gloves to assemble the garden bed. It would be better to fix in one suitable place and not to move after using, unless no soil in it. All the time to our valuable customer. We promise to help you out very soon. Each contact will be replied within 24 working hours. We do not accept COD /Personal cheque or company Cheque. The P&P is just for 48 lower states of US. Any rush order will be out of our acceptability. Defective items or problems with your order must be reported within 3 days after receiving. Please keep all packaging, documentation, packing list, etc. That came with your order. These will be used to verify claims if there is any problem with you. All replaced parts would be sent out by UPS Ground. Our warehouse needs time to prepare your order. It is very important please call our warehouse 24 hours in advance to make sure your order is ready. After this 30-days window, we will provide parts, replacement or repair service. Our customer service will try best to help solve the problem. Please check your spam folder if no response from us. 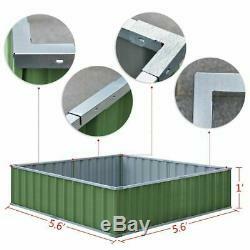 The item "KING BIRD 5.6x5.6X1 Galvanized Metal Raised Garden Bed Planter With Tag&Gloves" is in sale since Thursday, July 19, 2018. 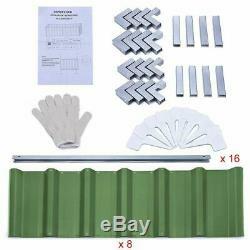 This item is in the category "Home & Garden\Yard, Garden & Outdoor Living\Garden Structures & Shade\Awnings & Canopies". The seller is "outdoor_edge" and is located in Dallas. This item can be shipped to United States.